1. Mix all ingredients except oil and powdered sugar. 2. Knead and let rise until doubled. Punch down. 3. Roll into rectangle. Cut dough into into 2 inch wide strips at a diagonal. 4. Cut again diagonally to form diamonds. Place on ungreased baking sheets, 2 in apart. 5. Cover loosely with plastic wrap. Gather up scraps and let rest 15 minutes. 6. Roll and cut as before. Let rise until doubled in bulk, about 45 minutes. 7. In a large saucepan, heat 3 inches of oil to 365 or until a 1 in cube of bread browns in 60 seconds. 8. 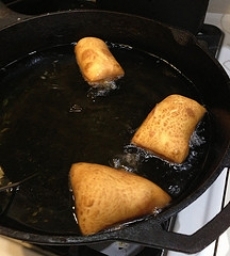 Carefully slide beignets into hot oil 3-4 at a time. 9. Do not crowd. Fry until puffy and golden brown on both sides, turning once with tongs. 10. Should be about 2-3 minutes per side. Remove with slotted spoon and drain on paper towels. 11. Sift powdered sugar over hot beignets and serve hot. This recipe contains potential food allergens and will effect people with Wheat, Egg, Milk, Yeast, Gluten, Natural Sweeteners allergies.